Dickinson, Robert L., Palisades Interstate Park, 1921.
exquisitely illustrated guidebook to Palisades, New Jersey Interstate Park, drawn and illustrated in 1921 by Robert Dickinson. Contains charmingly drawn views, detailed descriptions of various things to see and do along the interstate, and three foldout maps showing different portions of the interstates. 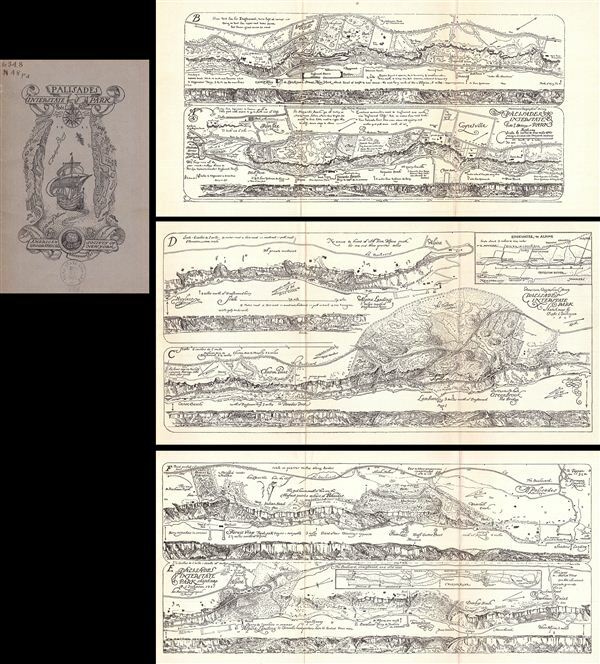 Fold out maps separated from but sold with original paper booklet, the cover of which is illustrated with a view of the Palisades and Henry Hudson's ship, the Half Moon. Published by the American Geographical Society of New York. Robert L. Dickinson, Americacn Geographical Society of New York. Very good. Original folds. Comes with original booklet. Dimensions are of the fold out maps. The book itself measures 7.5' tall by 5.25' wide.